15 Best Places with Great View of İstanbul & Bosphorus according to Foursquare Users | Do You Know Turkey | Turkish Tv Series & Drama, Turkish celebrities, travel information about Turkey and Turkish cusine. İstanbul has the world’s pearl necklace: The Bosphorus. Thank’s to its geographical structure, the city has many hills and valley’s and Golden Horn around the Bosphorus which gives the chance to see this beauty from different angles. Istanbul is one of the richest cities in terms of restaurants, hotels, cafe’s bars, teahouses and leisure places. There are many cheap and expensive places all around and most of them have great views of İstanbul. So preparing a list without the price category would be very hard, also the popularity will be other criteria because there are always some hidden places still waiting to get popular. The list from Foursquare useres are mixed with cafes, bars restaurants, hotels which have amazing view. Liam Rutter: Stunning views of the City and Bosphorus. Great food. Very large portions. Book at least a week ahead to get a table by the window. Damien Bénazet: Outstanding view !! The location is great and the food very nice and staff alright. Very good drinks and cocktails at the bar anytime in the evening/night. I highly recommend the bosphorus martini. 🎀 Do, or do not-there is no try: Very romantic atmosphere, great view and super tastey food! Absolutely recommend! 💎 Funda A. 💎: Sunset offers one of the best Bosphorus views.. The menu has both modern & classic dishes. Delicious foods, good music and service… should exprience İt..
Alvaro P.: One of the best views, if not the best, you can get from the Bosphorus, mixed with Turkish/sushi menu and a terrace perfect for summer times! Do not miss their kebab choices, delicious! Brian O: Was soooo amazing. Food, view, service – all perfection. Katiussia Paiva: The view of the terrace is amazing. The service, the food and the drinks are great. Order the beef as main course. Arda Aydın: An amazing view, great choice cocktails and nice selection of wine. Pretty much the best stop in Istanbul. Certainly not cheap but deserves it to the fullest. Friendly stuff. A must see. Abhishek: Awesome views of the old city. I would recommend visiting in the evening to take good photographs of the panoramic views of the city. Alireza Mirzaeian: Absolutely gorgeous view of Istanbul! A great place to try! Kubra Basar: Always a pleasure to visit. Amazing view and good service. Abdulrahman Almutairi: chic restaurant and it has a wonderful view of Bosphorus, the sunset is wonderful and they have very nice sushi menu. Marti Balamir: Fantastic view! 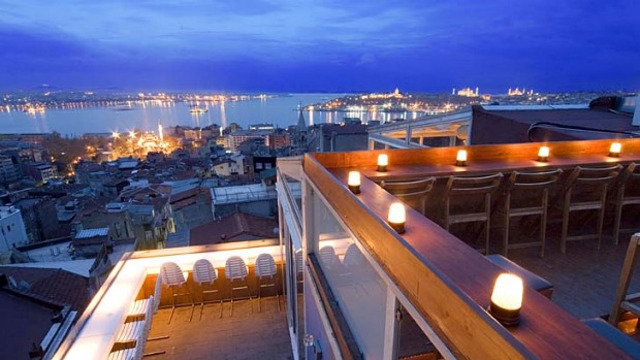 Try to sit in the balcony to enjoy the magnificent Bosphorus view.. The breakfast menu is enough for two. Also nice for lunch, dinner and drinks.. One of my favourites in Istanbul..
Dom Graham: Good food, amazing view. Very cool. Melissa Erdagi: Number 1 choice for fine dining turkish cuisine. Great food, phenomenal views. Kaniye Onat: Good food, good service, beautiful view of Bosphorus ! Mim Sin: Great view, beautiful for brunches. At night with less Bosporus view I don’t recommend. Eggs Benedict for brunch is awesome. Staff a bit uptight. This place can get a better chef or menu!!! Andrew Hyde: Fantastic view, great for coffee and lunch. M K: Great music! An amazing view on Bosphorus plus really delicious food. And WI FI!!! Olga Protassova: Make sure you go to their terrace with an amazing view of Bosphorus. Beautiful place, delicious food, very good service. Enjoyed our time there. Ahmed Sabri: This place is awesome! Try the cafe great view and nice food! Daria Lazovskaya: three awesome exhibitions going on right now, numerous video installations, restaurant with fantastic view to Golden Horn and Bosphorous. be sure to give it at least half a day! totally recommended! Gozde Carmikli: One of the best hotels in Istanbul.. Also the view of the bosphorus is amazing… Give it a shot..
Mteto Nyati: Best views of the Bosphorus and great customer service.